From Michael Sam playing in the Canadian Football League to the MLB issuing a line of “Pride” hats and shirts to the Boy Scouts and Girl Scouts each making news, it was an interesting week. According to NFL.com, Michael Sam will be playing football this coming season but not in the NFL. The Montreal Alouettes of the Canadian Football League announced Friday that they have signed Sam to a two-year deal – according to Sam’s agent Joe Barketta, it’s a one-year deal with a team option year. Sam had spent parts of last season with the St. Louis Rams and Dallas Cowboys but wasn’t picked up for the season by either team. Sam became the first openly gay player in NFL history when he was selected by St. Louis in the seventh round of the 2014 NFL Draft but many suggest his openness is what kept him from being picked by teams fearful of the distraction factor. They put up a sign directing traffic to the event this year and no protesters bothered to come. 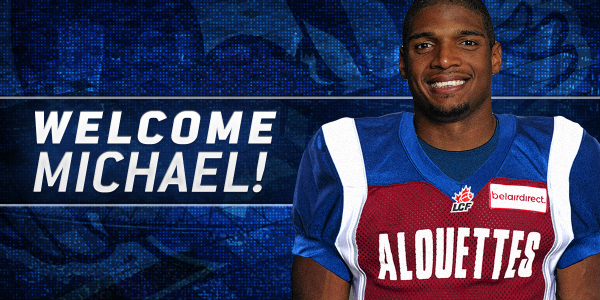 Photo Credit: Montreal Alouettes via Twitter.